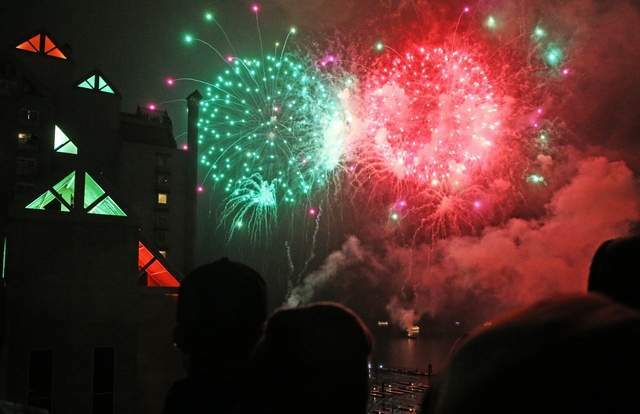 COEUR d’ALENE — The weather outside was frightful, but the fireworks of the 32nd annual Coeur d’Alene Resort Holiday Light Show were so delightful. 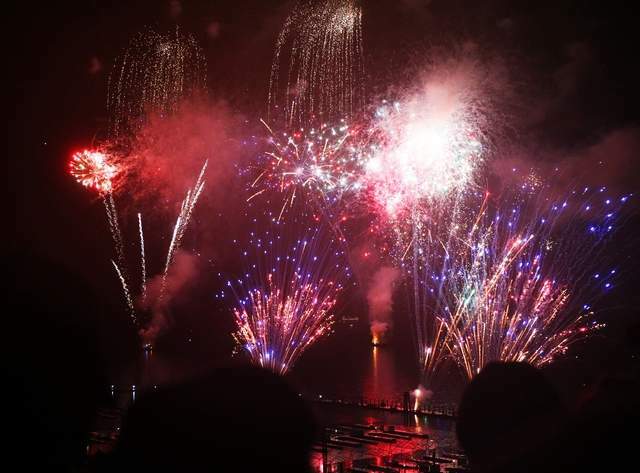 Shults’s son, Michael Standridge of Seattle, and his girlfriend, Danielle Petty, shared a romantic kiss as the final fireworks exploded overhead and the more than 1.5 million lights turned on to begin the 2018 holiday season in North Idaho. It was only his second time seeing the holiday show, and her first. Shults gave a big shout-out to the high school bands for marching in the parade despite the cold rain. 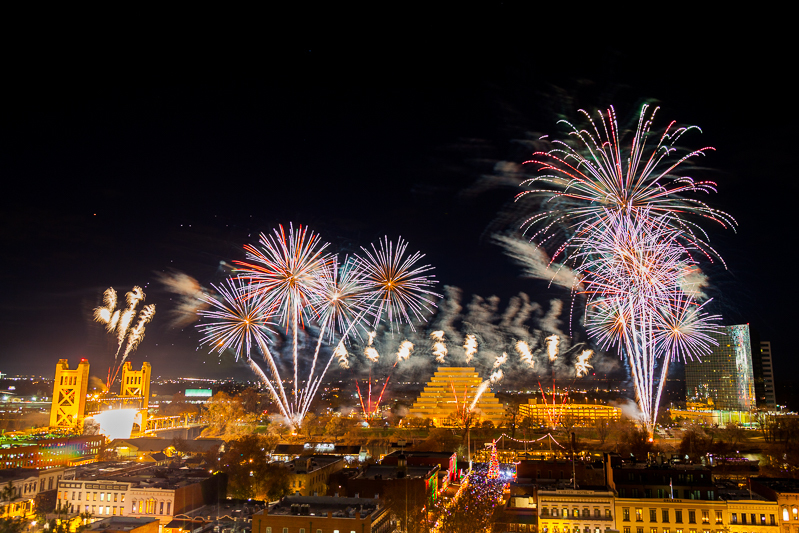 She and her husband, Dave, have been to many of the lighting ceremonies and were in agreement that this year really shined as a true hometown event. 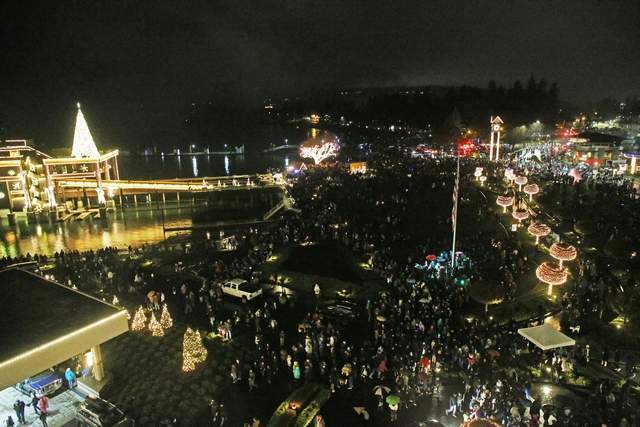 Christmas spirit sparkled all throughout the Coeur d’Alene Downtown Association’s 27th annual Lighting Ceremony Parade, which consisted of a variety of 45 parade entries. The Alta Dance Academy performers wore flashing green bows in their hair and skirts made of light-up hoops as they paraded with a Dr. Seuss “Welcome to Whoville” theme. “It’s really fun to be in the parade and dancing with all your friends by you,” said Mackenzie Gallagher, 14, who was enjoying her second time in the holiday parade. While many of the entries were lighthearted, a few were festive but also conveyed serious messages, including B.A.T.A.A. (Bikers Against Teen Addiction and Abuse), local law enforcement and the Leeder family reminding people not to drink and drive and more than a dozen canines and their human counterparts marching for Hank’s Law. Wendy Leeder, mom of Jacob Leeder, the 16-year-old who was killed by a drunk driver last December, was with friends and loved ones in a float surrounded by police vehicles as they honored Jacob’s memory and raised awareness about impaired driving. People ducked for cover in doorways and squished together under eaves to get out of the rain. Rick Villwock of Coeur d’Alene and his fiancée, Michelle Engelbrecht, didn’t mind the weather as they enjoyed the holiday outing. Engelbrecht said they don’t always make it to the lighting ceremony and holiday parade, but this year was special since her son and grandkids were visiting from out of town. They both really enjoyed the celebration. “I like how the community gets involved,” Engelbrecht said.